The use of steel sheet pile cofferdam is ideal for the construction of high plasticity soft soil environment, in particular the steel plate pile, the high plasticity of the flow box in order to effectively soil pits in the middle of the steel sheet pile seal curtain can Be The effective formation, ie, the effective toe Bessel ring method, will overcome the disadvantages and collide to be shown. This is mainly 3-8 m, for the soft soil in the region is under the hard soil 8-10 m thickness. 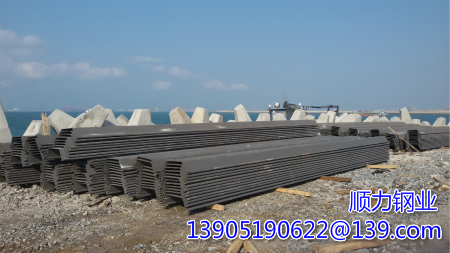 Long steel sheet pile can be inserted into the hard soil, the problem of its uplift pit can be overcome, there is a distortion Please do not worry about the bottom of pile soft soil. Inserting angle sheet piling effectively pulls the anchor (flat or support) The excavation works are temporary and can also resumed by the steel sheet pile, the construction of the steel sheet pile by leasing, generally generally, in a transversal direction of the top of the hill, and the duration is much shorter. . Overall, the steel sheet pile to keep the program safe and reliable, rapid construction of the local cost advantage, especially for the high traffic shaping Ningbo pit. Production line of 55, modern steel sheet pile production line, spiral pipe pile production line, H-type composite pile production line, corrosion, welding, pipe lock and a variety of heavy steel products production line ranks the world's leading level. Technology innovation is the rapid development of genes, China's first cold-formed steel sheet pile patent was born in Shunli, Shun force to create the technology research and development team to lead the development of the global steel sheet pile direction, won more than 20 national Invention patents, utility model patent.